Yu Jinyoung portrays truth and illusions of a family with a house, the hideaway of these people, as a background. The artist’s previous work expresses a portrait of humans trapped in a society, and she has moved the meeting of her work into a fence called as home. Through everyday lives of family in very limited space called home, the inner world of family is closely examined. The family wants to turn away their eyes from all discords and indifferences that are happening in a form of home, which should be intimate the most. They refuse an exposure to the outside by hiding themselves because they don’t want to show their pretentious look as a friendly family. How the alienated family disguises themselves as friendly ones is portrayed through an uncomfortable meeting with guests who attend to family events like big holidays. The children, who came to terms with reputations and bluffs of adults from guest’s visitation, automatically adapt themselves to hold down their emotions. The emotion spreads so far as to a dog. The artist used a splendid flower on wall, clothes and even shadow in order to hide sad emotions of the family. The flowers in this work may look as a beautiful decoration for welcoming guests. But an intention of the artist is that the flower is more of a concealing tool than decoration. The pattern scatters one’s eye from family’s gloomy face to the splendid flowers and it produces a bright atmosphere. With this, it seems as the work has changed to a splendid image from the clear and simple works in past, but the artist’s intention of what to express with that face is unchanged. La escultura es una de las manifestaciones artísticas que más seducen –en mi opinión–no solo por sus características principales de textura y espacialidad, si no también por el diálogo que puede tener con el ser humano. 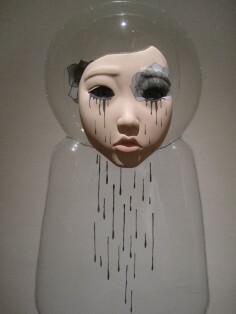 Les presentamos el trabajo de Jin Young Yu, escultora de origen coreano, que por medio de la arcilla y el PVC, con técnicas desarrolladas por ella misma, crea personajes de cuerpos transparentes y rostros de arcilla de impecables acabados. Son rostros fingidos e inexpresivos en esculturas de tamaño real que parecen ocultar algo. Es así como Jin exhibe, de manera creativa, a aquellas personas que son invisibles, poco percibidas, inadaptadas, marginadas, deprimentes y que mantienen distancia dentro de una sociedad. Expresa de alguna manera sentimientos que todos llevamos dentro y que deseamos ocultar, podemos ver el disfraz o la falsedad, y sobre todo el deseo de ser invisibles. Jin Young Yu, artista coreana, nelle sue sculture vuole rappresentare le persone che, invece di andare d’accordo con gli altri, scelgono di mantenere una certa distanza da loro, ed essere invisibili. Invece di cercare di adattarsi al mondo, si arrampicano in uno spazio proprio e respingono le intrusioni di altre persone. Visto che le sue sculture sono un “popolo invisibile”, ha cercato la completa trasparenza, così ha scelto il PVC. Ci sono voluti molti tentativi per cercare di capire come infondere tridimensionalità a questo materiale, l’effetto delle sue sculture in dimensione 1:1 è di grande impatto e la trasparenza gli conferisce una visione spettrale. “Meus trabalhos simulam rostos inexpressivos. Eles estão segurando lágrimas e engolindo elas ou tentam colocar uma cara legal, apesar dos vestígios de lágrimas em seus rostos. Ou simplesmente, eles parecem estar escondendo algo por trás da simulação de seus rostos inexpressivos. Os seus rostos não deixam com que as pessoas se aproximem com facilidade, um olhar de desconfiança e cautela faz evitar que outros os abordem facilmente.”, continua Jin Young. Seu trabalho fala sobre a sociedade moderna que nos obriga a nos disfarçarmos e viver uma vida hipócrita para distinguir os outros e a busca por também sermos reconhecidos. Fazemos tantos esforços para viver e nos adaptarmos ao que os outros (nossa família, amigos, colegas de trabalho…) esperam da gente e ficamos presos num auto controle permanente. As personagens de Jin Young formam uma família que tenta ocultar as mágoas, discordâncias e indiferenças que acontecem numa casa. Um exemplo são as crianças tem que se adaptar para esconder suas emoções quando ordenadas por um adulto.